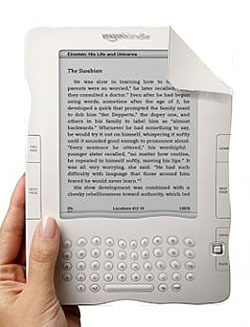 NewsBiscuit has uncovered details on the next generation of the Amazon Kindle, currently named the Kindle DE. We all know someone who loves the physical features of paper books, right? Well, that's the person that Amazon designed the Kindle DE for. This model departs from the crisp, clean lines of the K3 for a creased and crumpled look. The software has also been updated. It's now going to include random stains on some pages. "We are especially pleased with that effect," said a spokesman for Amazon, adding, "as well as the usual beverage spill marks, users can now simulate their own book stains, by simply choosing a number of modes such as chocolate, blood and ‘unknown but brown and worrying.’ We see this feature appealing to those who are used to the horrors of reading books borrowed from public libraries." They've also figured out a way to remove the last way that digital textbooks fall short of paper textbooks. The Kindle DE will auto detect textbooks and randomly add highlighting, irrelevant notes, and the occasional obscene doodle. I can't wait for it to hit the market. Sadly enough, I know plenty of people who would buy this. But how about the smell? If it doesn’t smell of fungus and silverfish crap, it’s just not a real book. I just googled my website, and this came up – very funny!